According to IWF press release, The IWF Bodyweight Categories Working Group met in Budapest on 31 May – 01 June to begin the final phase of determining the new 10 women’s and 10 men’s bodyweight categories, which will provide greater athletic opportunities, improve inclusivity and enhance competition. The Working Group reviewed the wide-range of proposals which have been submitted by the IWF’s stakeholders as well as conduct their own comprehensive research. In line with the internal decision making process, the proposal will be submitted to the IWF Committees and Executive Board at the next meeting in July 2018. The Working Group is composed of members of the IWF Sport Programme Commission and two representatives from each of the three elected IWF Committees appointed by their respective Chair. The decision to increase the bodyweight portfolio from eight men and women’s categories to 10 was taken by the IWF Executive Board in November 2017. The Working Group finalized its proposal on the 10 categories in each gender drawing on a number of different factors using scientific and statistical evidence. The seven men’s and seven women’s medal events for Tokyo 2020 will be drawn from the 10 men’s and 10 women’s bodyweight categories once they have been agreed. 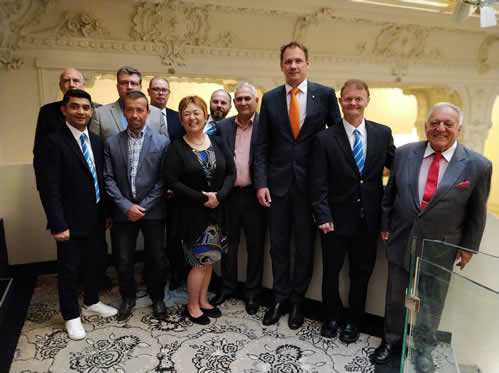 The meeting was opened by IWF President Tamas Ajan in the presence of the IWF General Secretary Mohammed Jaloud and the President of the Hungarian Olympic Committee, Dr. Krisztian Kulcsar. During the meeting there was also discussion on the method to be applied to establish new World and Olympic records, new minimum entry totals for IWF World Championships and the structure and conditions for a refreshed global calendar of events.